Hi guys, I recently met with a client who's a little overwhelmed with her dark gray sofa that a previous designer convinced her to purchase. And since she usually decorates with warm colors...making the transition from a warm color scheme to a cool color scheme has been a challenge. And In addition to this gray sofa her walls and ceilings were painted blue resulting in a space that feels cold and flat. For the walls I chose a cool greige called Modern Gray from Sherwin Williams (it's the gray square behind the mirror). I also chose cool accent colors in greens and teals. But to keep this space balanced, I introduced a few warm colors in copper and browns. The overall look is warm and inviting...yet still modern with the abstract art and mid century modern sofa and chairs. Okay guys, need a Mood Board Design for your decorating dilemma? As a Design Consultant and owner of...Finding Fabulous by design, LLC - I create Custom Mood Board Designs starting at just $40. So shoot me an e-mail. I'll hook you up with a new design, and get you back on track with a stylish new room...for less! I love the copper with the grey - very rich and cozy. Hope she likes it! 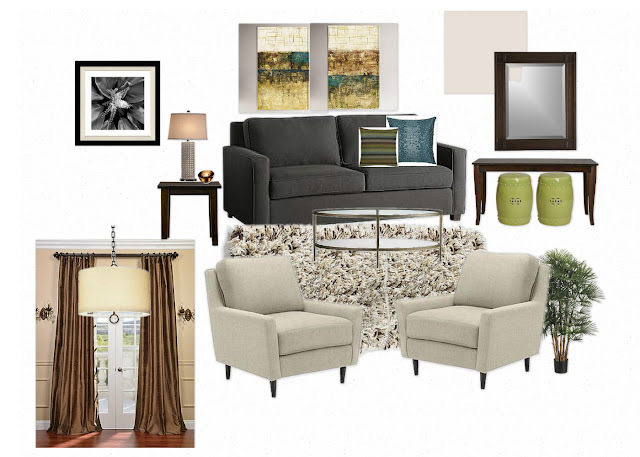 Thanks Julie...it's a very simple color scheme - gray, cream and copper, with blue/green accents! Geat mood board. Well done. Thank you Rose...they are so fun to create!